It's really an awkward situation when someone inspects your last seen status on WhatsApp? The situation can also be ignored if you take steps on it before. WhatsApp has its own last seen tracker that catches you while you've been online. WhatsApp provides the option to show or hide your last seen status but this hides your friend's last seen time as well. If this is the problem for you then this article might be helpful for you. Whenever you come active on WhatsApp your contacts can see the last seen timestamp on chat. It really feels them badly if you can't reply to messages you received. Turning off last seen on WhatsApp helps them know that you have hidden your last seen status. There are some apps which can help you to create fake last seen on WhatsApp. These are the app which can make the last seen timestamp changing to a fake active time in chats. This procedure can freeze the last seen time from reoccurring or show not an original time. The best app to do this using GBWhatsApp on your mobile devices. GBWhatsApp is a popular app which adds a lot more features in comparison to the WhatsApp. Besides creating fake last seen status, GBWhatsApp Plus has useful features like Recording, Blue Ticks and Second Tick etc. Step 1: Open your internet connection and install GBWhatsApp Plus application. Step 2: Give some time for the application to install. The main purpose of this application to install create a replacement for your existing WhatsApp application. Step 3: Once the application successfully installed, open the application and click on the menu. Step 4: Now tap on the menu. A new bar would open stating various categories. Following the above steps successfully will generate an image something like this. Step 5: Once you see this long list options, be sure to click on the privacy tab. 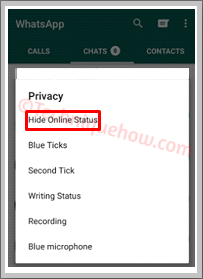 Step 6: After you click on the privacy tab, an option will appear which will ask you to hide your WhatsApp status. This option will be known as hiding online status option. Step 7: As soon as you hit on the 'Hide Online Status' option. The application will automatically record this time and show this as your last seen to your contacts. Note: For example consider you have tapped on the hide online status option at about 8 pm in the evening. Now the application will record this time and show this to your contacts, which means everybody will see that you have been online last at 8 pm even though you have checked messages in the next morning. This process might help you to make a fake last seen status on your WhatsApp. But, you may be thinking: Is there any other alternative apps to this? Yes, apps like WhatsApp+ can also do this work. Try any of these apps and comment below about your experiences in showing the fake last seen timestamp to your friends.